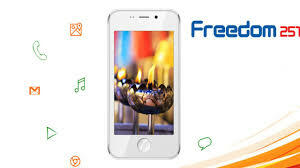 Everyone knows about Freedom251 mobile, which most cheapest mobile phone till yet. And its making headlines over every media from couple of days. There were many thing saying about the handset price and also pointing out to be a scam. For these topics finally Ringing Bells CEO, Ashok Chadha, has spoken out about the Freedom 251 smartphone. Q1. There seems a problem with the payment gateway while ordering the phone from the freedom251.com website. Why and How soon will it be resolved? Has the sales stopped permanently? Ashok Chadha: This problem occurred on morning of 18/2 consequent to the pleasant deluge of viewers where even the high performance Servers of our Payment Gateway and our main Server Providers could not cope! [There were 20 lacs requests on 18/2 at the peak load and the total no. of registrations received on the day were 3,70,15,000!] We addressed the problem on a 'war footing' and with the help of our associates, were back on-line by 06.00 hrs by morning of 19/2! Registrations have continued smoothly thereafter. Q2. How many handsets have been sold so far? AC: 30,000-plus, and these were on Day 1 reflecting the fact that our Payment Gateway could not support the Transaction Load, and as per guidelines that are deposited in the Nodal Account with the Payment gateway, the company will claim payment only after submission of Delivery Proof. We have 3.70 crore registrations on Day 1 and 2.47 crores on Day 2, as of 19:49 hrs. Q3. Why has Freedom 251 got Adcom branding on the front panel? Is it being manufactured by Adcom? And why was the branding covered by a whitener?Â What was that for? Even if it was just for demo and a sample phone why did the company fringe into other company products for that, why could not they just order fresh samples from where ever they were trading? AC: We just wanted to show a sample/prototype of what the handsets will look like. This is not the final piece. We obviously wanted to provide "Made in India" handsets as that is the core of our vision. We did a quick and intensive search and located the components but not the touch plate (panel), we faced a problem in view of the fragile nature in addition to the scratch-proof requirements of the piece. ADCOM is an India Company and we were able to source from them. In view of the shortage of time and given that these were to serve only as prototypes given FOC to a limited List of persons, we went ahead. We would clearly mention that the Final Freedom 251 manufactured/ assembled in India would be to identical specs, i.e., no change! There maybe some changes in curvature/ buttons placements for aesthetics, if at all. Q4. Deeper media investigation suggests Adcom is a local manufacturer of IT products and their spokesperson had no clue that their product is being re-branded and sold like this. This can be a potential lawsuit. AC: You may speak to Mr Sanjiv Bhatia - the Director of ADCOM - and he would confirm the true version to you. Q5. The promised pre-loaded apps of fisherman and farmers and woman safety are not present on the mobile handset that the media received. AC: These will be on the "Final Freedom 251" with our custom designed new UI. Q6. The user interface icons are exactly like Apple's iPhone including icons like web browsers, etc., which can be construed as copyright infringement. AC: As will be noted on a closer look, that the UI, even on the prototype, is not identical to Apple. In any case we will have our custom designed new UI for our Final Freedom 251. Q7. The phone is not listed on the BIS certifications page, why is this? AC: Application is under filing and we expect to have the Certification in hand well before delivery commences. Q8. All 3G devices are supposed to be registered with Qualcomm as part of the licensing agreement, but the Freedom 251 is not showing up, why is this? AC: At present, we are using Spreadtrum Chip set, then why do we need to register with Qualcomm? Q9. The phone is running on Android, but is not showing on a list on Android partners either. Why is this? AC: We are registered with Google Android Developers Platform. Screenshot below. Q10. If the actual phone is not ready, why was a rebranded, different phone given to the media? Is the much hyped Freedom 251 a concept in the air only? AC: When we design a concept, we produce a prototype to demonstrate. Then we test the acceptability from the Target Audience. Once this is accepted, we take this prototype to the design house to design the chipset, the mould, and then we decide on the actual add-ons like the buttons, the colour, screen quality, etc. We did not distribute the handsets, we handed over the prototypes FOC to assess the acceptability and vaiidate our concept. Q11. How is Indian government partnering with a company with no proven track record? BJP MP Kirit Somaiya has raised questions and written to both TRAI and Min. of Telecom to investigate the issue. This follows mobile industry body Indian Cellular Association (ICA) letter to Telecom Minister Ravi Shankar Prasad yesterday to get into depth of the issue, saying the rate could not be below Rs 3,500 even after a subsidised sale. They are willing to give all the technical assistance. AC: The Indian Government is not partnering (with) the company. We will comply with all required regulations of TRAI & telecom authorities in India. Q12. What about the other handsets? People have been complaining about no delivery or even an order confirmation? Is this just a con game? AC: We have delivered Rs 1.7 crores worth of phones so far. In addition, PayU [Payment Gateway] has received Rs 1.75 crores against our dandset online bookings of Phase 1 and here, as we have committed, we will claim our money only after we complete delivery on Feb 25, 2016, and submit Proof of Delivery. Q13. Some media persons reaching the Ringing Bells Pvt. Ltd. Noida office found it to be deserted. Is it even a genuine company with manufacturing plant? AC: Our Corporate Office is at B44, Sector 63, Noida 201301. All are welcome to come to our office, and we will be privileged to greet you!